Single Family Detached Home - This home has been totally remodeled from the floors to expanded bedrooms and updated bathrooms! This is a four bedroom home...the master bedroom has its own private bathroom. All of he furniture in the home is included and brand spanking new! There is a roof top deck big enough for outdoor furniture. The backyard has a wonderful garden, covered patio area and large open area for sunning. The front yard is large also and has both a huge care gate and a pedestrian gate. There is a storage room that could be a great maid's room off of the backyard. There are two outside bathrooms, plus a laundry room with shower area. The kitchen and living room are on big great room. 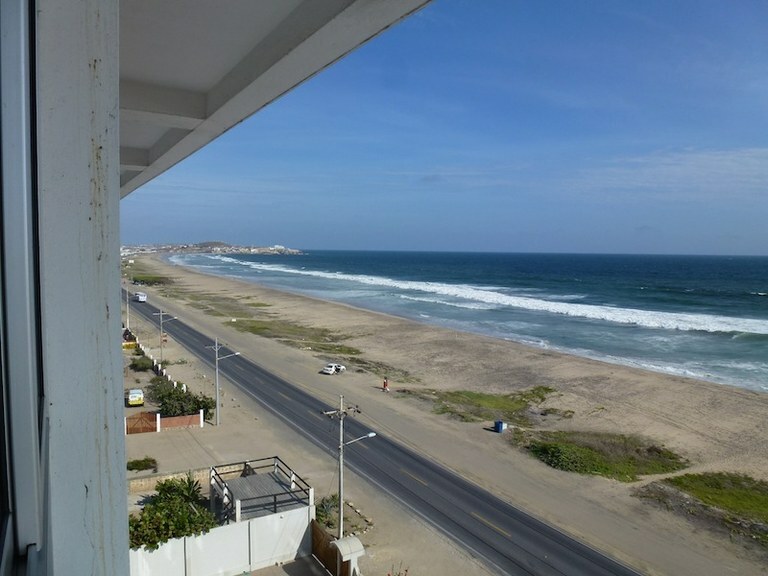 JUST REDUCED-Condo Punta Carnero - Another Day at the Beach! Fabulous Views...Great Price!! You can't get much closer to the beach than this. This beautiful 2 bedroom three bath unit is directly across the street from the beach in Punta Carnero (just 5 minutes from the Salinas Shopping Mall). Nothing will EVER be built across the street to block this fabulous view. The condo is 1,000 sq. feet and laid out very nicely with the living area/kitchen AND the Master Bedroom all having views to the Pacific Ocean. This is on the 5th floor and YES… there is an elevator in the building. The pool and jacuzzi in the social area is very inviting and big enough to swim laps if you wish. The unit comes with appliances and the furniture is negotiable. The kitchen is very nice and perfect for two people preparing your meals at the same time...or hire that full time maid/cook for just $250 a month. You have a gated secured parking area and 24 hour security. Punta Carnero has become a very popular stretch of beach with the expats and you will find plenty of folks to socialize with if you wish. The area has a wonderful breeze coming off the water...so just open your windows and enjoy the fresh sea breeze. This place is perfect for a couple or single person that want to start enjoying the easy going lifestyle you will find here on the coast of Ecuador. Take you pick. You can buy either floor of this Private Estate and share the luxurious pool and grounds. This also includes 1/2 interest in the roof top that can have another floor built on it. Could be an excellent investment for the right person. Capaes in not only for it's luxury estates but it is one of the most secure sought after beaches in Ecuador. Each floor has its own private entrance and access to the pool and grounds. The second floor has never been used. The lower floor has 200mt2 of construction and the second floor has 225mt2 of construction. The two units sit on approx. 600mt2 of land. If you looking for the full investment you can purchase the whole property of 900mt2 on land and 425mt2 of construction. This option give you an additional buildable lot that can have two floors and add the third floor yourself. Way to many options but one may be just right for you. This is the only high floor unit in the Tiburon Building in Chipipe that is currently for sale! It is a huge 4 bedroom, 4 bath condo with great views all around. The interior is in need of a full remodel however the building was just painted and the building's finances are in great shape! Units in similar condition in this building have recently sold in the mid $150,000's and up and are currently being completely remodeled by the new owners. The large living room, kitchen and bedrooms make this unit a perfect blank slate on which you can design your dream home in the quiet and exclusive neighborhood of Chipipe in Salinas. The beach is right outside, the building sets up a sunshade just for you everyday. There are 2 elevators and the building's electrics were just replaced! 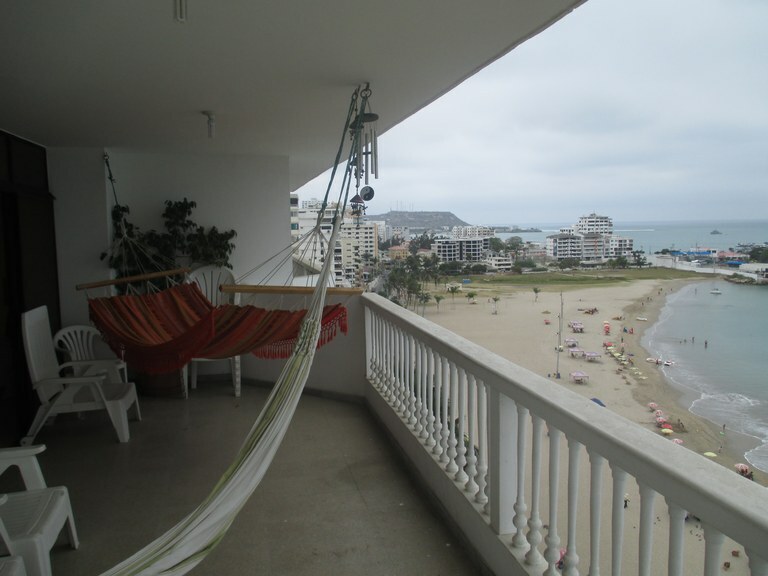 This condo located on the 10th floor of a well located building on the malecon of Salinas has amazing views, large bedrooms, a huge living room and dining room and a terrace big enough for 2 hammocks AND a table and chairs. In the front of the unit is a large master bedroom with its own door to the terrace, a large closet and a roomy bathroom. There is a second bedroom that has its own entrance to the guest bath located across the hall from the kitchen. This bedroom also has two large closets. In the back of the unit is another large bedroom with its own bathroom meaning that this unit has dual master suites. 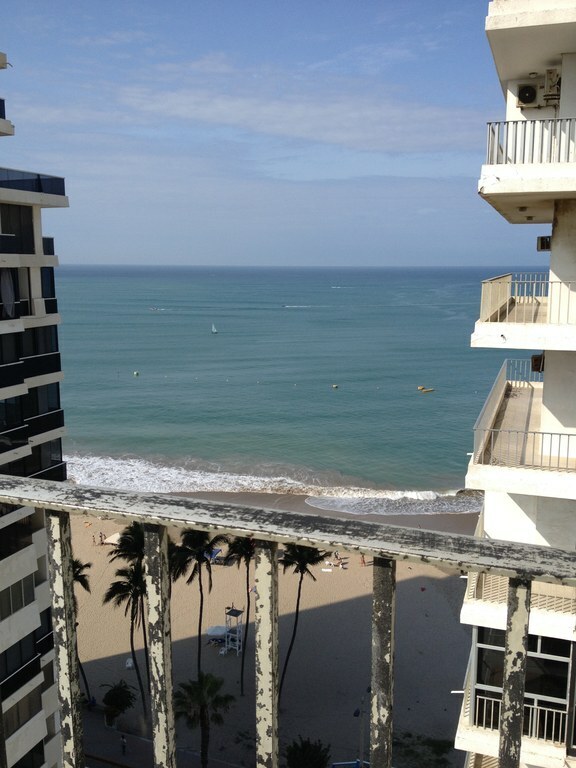 This back master bedroom has 2 closets, a large bathroom and great views of Mar Bravo. The kitchen is well laid out but needs to be updated. There is plenty of room for this if you expand into the laundry room or even further into maid's room you can have the kitchen of your dreams, looking across the spacious living room and out to the big, blue Pacific Ocean. The views from the terrace are incredible due to the high floor location of this unit. You can see past Chipipe, the Yacht Club, east down the beach towards San Lorenzo, and north up the coast to Manta on a clear day! The building has been very well taken care of. It was recently painted, the entrance has glass doors and 24 hour security and every unit has a storage closet. There is a parking lot conveniently located behind the building. Stores, bars restaurants and pharmacies are also right outside. The beach is right across the street where you can rent an umbrella and spend the entire day eating seafood and enjoying a cold coconut. 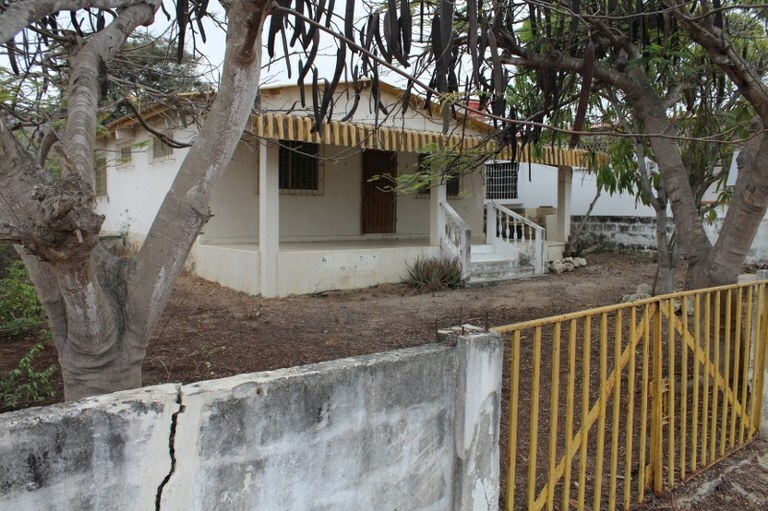 This property for sale is a great investment in Ecuador Real Estate. This 3 story beach house for sale in Ecuador. 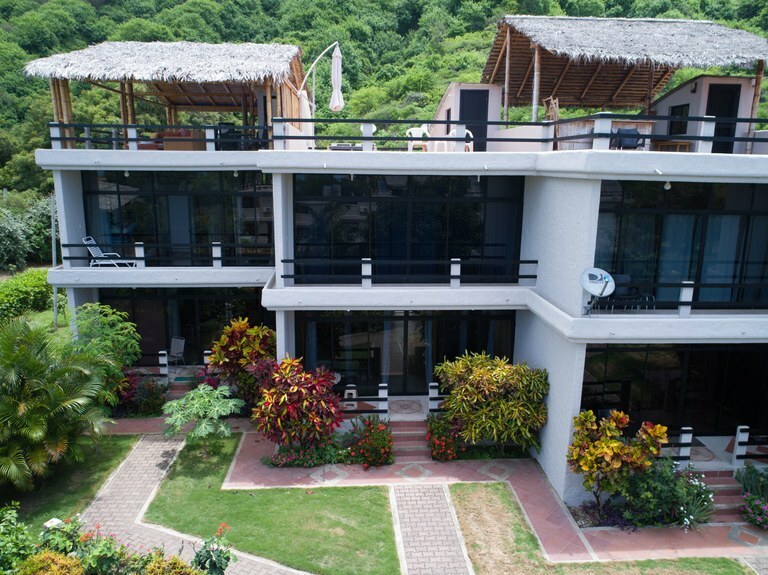 This Ecuador Beach Vacation Condo at Vistazul features amazing views and sunsets. 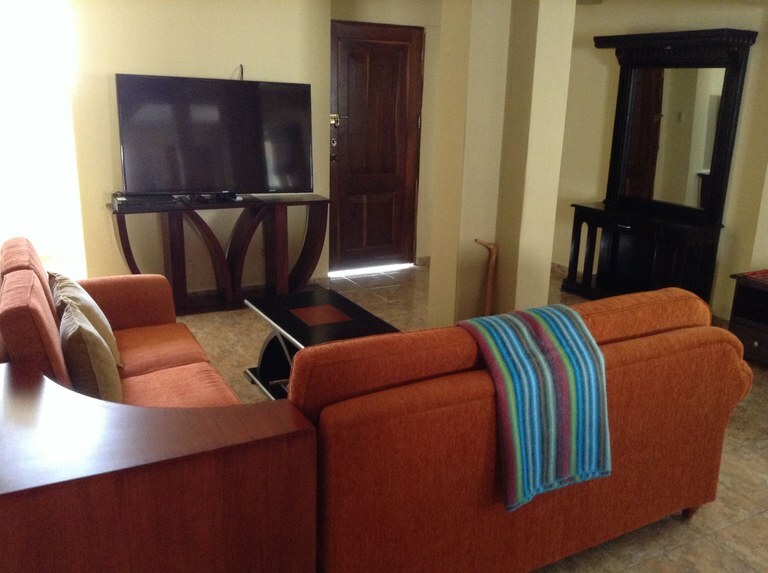 This beach vacation condo for is located in San Clemente Ecuador. Vistazul Complex is a tranquil development. 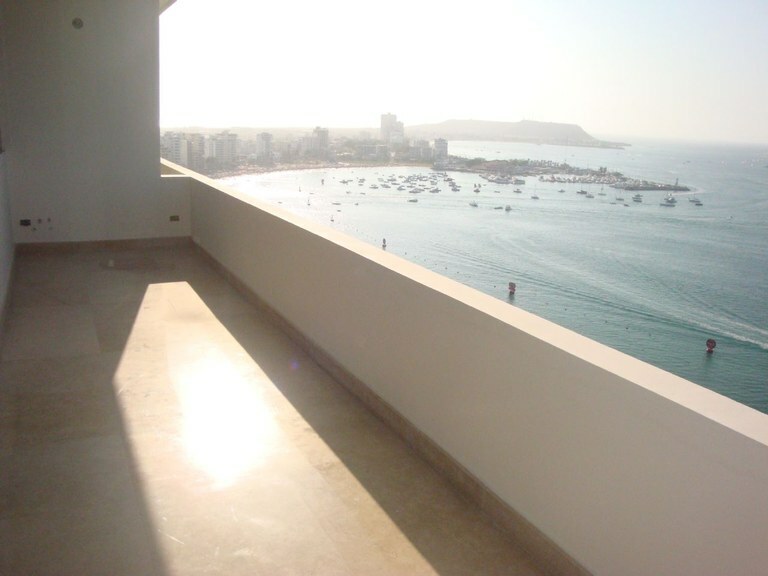 Vistazul Condo For Rent offers you relaxation, exclusivity and security. 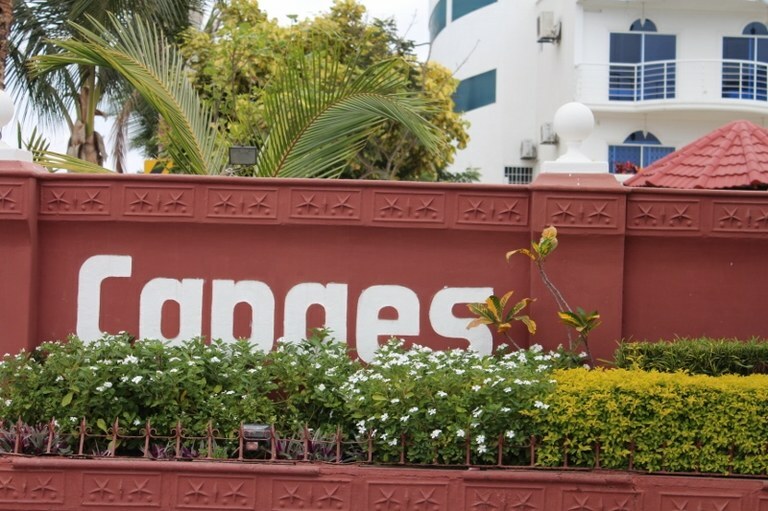 San Clemente is a small fishing village with excellent beaches in the Manabi province on the Pacific coast of Ecuador and is a short 40 minute drive to Manta airport. This apartment have a 40 inches Tv and a queen size bed. Wood barstools for the bar kitchen counter. Screen doors and windows. Project Punta Blanca: This project is ready to be taken over and built into whatever you can imagine. 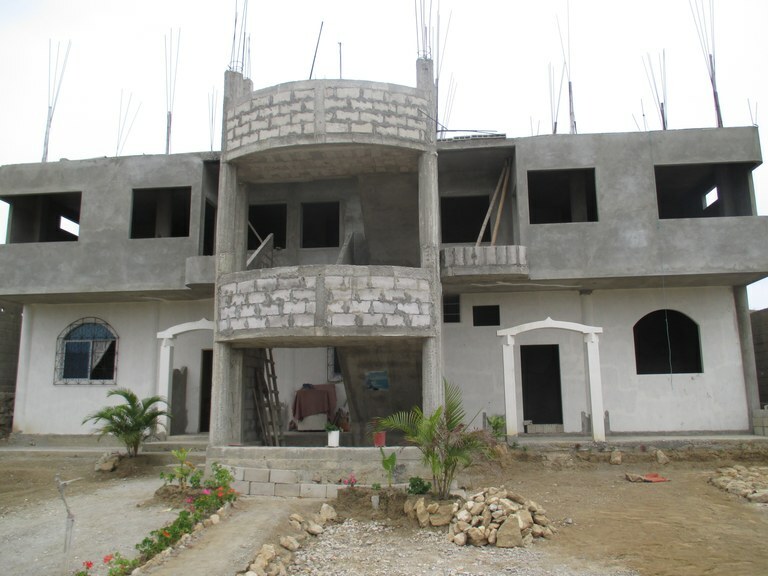 Located a few blocks from the beach in Punta Blanca, this 5 unit condo building needs someone who can come in and finish it off. The ground floor unit is nearly complete, the 1st floor is walled in and all plumbing and electrical conduits are in place for the construction of the top floor. There is ample space for social areas and a pool in front of the building as well as parking. From the top floor you have ocean views, the other units will have views of the social area and garden. All the permits are in place to finish the building and all the documents are on hand for the sale. Once complete the units can be sold as condos, used as rentals or even longer term hotel stays. Casa Las Brisas: SORRY SOLD!!!! SORRY SOLD!!!!! This home is livable now and has lots of potential depending on your needs. Great location just one block off the main Hwy and excellent transportation. Only a 5 to 10 minute walk to two different beaches and the fresh catch of the day. This ground floor 1 bedroom 1 bath apartment has been remodeled in a clean, modern style. 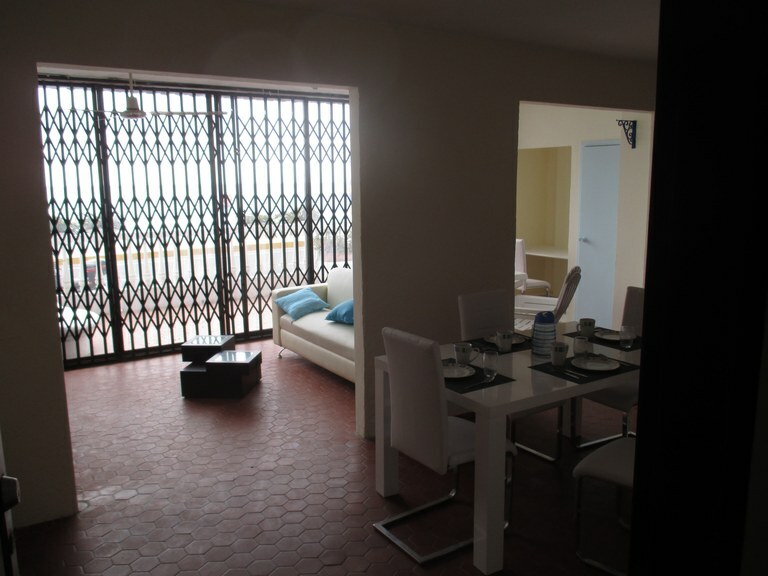 A highlight of this apartment is the large private patio off the living room and only feet above the malecon. There is a security gate that can be closed across the sliding glass doors at night or while you are out. There is internet and Direct TV, a new flat screen TV, all new furniture and mattress, as well as a convenient comuter station. The apartment is fully appointed and move in ready! ...BUYING A FRONT UNIT WITH A BALCONY IN A QUALITY NEW CONSTRUCTION BUILDING...YES!!! This gorgeous unit overlooks the absolutely stunning Salinas Bay. Look at the colors of the ocean from here! This unit can be bought as a two bedroom (which it is currently) at 162m2, two bedroom or the owner can have the third bedroom added (he owns the unit behind this unit) which would make the unit 189m2. The price for the three bedroom would be $349,650. The kitchen is located right off the balcony which makes it so convenient to talk to your guests whether they are in the living room, dining room or on the balcony. The kitchen is always the central point in every home. The finishes in this building are really nice. This building has two pools, jacuzzi, exercise room, sauna and steam room. There are no other ¨B¨ units for sale in this 2014 construction. The furniture is available for $30,000 more. Hurry!